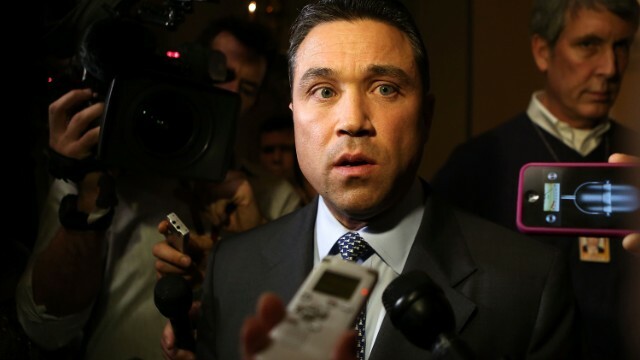 (CNN) - The House Ethics Committee will formally investigate whether Rep. Michael Grimm violated any of its rules. But the panel said it would defer its action for now at the request of the Justice Department, which is prosecuting the New York Republican. Grimm pleaded not guilty last month in Brooklyn to charges of filing false tax returns, mail fraud, wire fraud, hiring unauthorized aliens and perjury. Federal prosecutors say he failed to report $1 million from his restaurant business in Manhattan before he was first elected to Congress in 2010. The ethics panel had already been conducting a preliminary review of the Grimm matter, but the case rises to a new level with the establishment of a formal probe. Grimm has stepped down from his post on the House Financial Services Committee, but said he will remain in office and predicted he would be "fully exonerated." He is running for a third term in his Staten Island district. What kinda toast is this guy? If the Justice Department is prosecuting the New York Republican. Rep. Michael Grimm is done , his political carer is Over . Grimm will take asylum in Israel to avoid doing time , just wait and see . Another corrupt politician, is anybody really surprised? An "ethical politician"???? Now that's an oxymoron if I ever read one. Remember, folks. This is the same guy who was caught on camera threatening to throw a reporter off of a balcony in the Capitol building. Remember that? Same guy. He's also the same guy who had previously physically threatened another reporter from the same cable news channel, which resulted in no charges but the station banned him from their premises for life. I like his name, Grimm. They should investigate the money that Guns Over People teatards are reaping over the graves of four dead Americans. THAT is a scandal but FoxLies won't bring it up. *rolls up newspaper*...No! No no no! That's a bad liberal!!! There's a reason we use "Teatrolls." You should know better. Is he by chance any relation to the Brothers Grimm? He sure knows how to spin a fairy tale! Fully exhonorated? He's been taking advice from the troll under the bridge, I see!! A thug is a thug, regardless of party.